Scientists pushed to get the LST project off the ground into the 1970s, and managed to convince the US Congress to provide funds to support the project, as well as getting the European Space Agency on board as a partner. In 1983, the telescope was officially renamed the Hubble Space Telescope (HST) after the great astronomer Edwin Hubble, who, amongst his many contributions, had established the expansion of the Universe. The telescope was finally scheduled for launch in 1986, but the loss of the Space Shuttle Challenger delayed it further until 1990, when it was launched on April 24th on Space Shuttle Discovery. Soon after it went into operation, it became clear that there had been a major flaw in its manufacture, and the primary mirror collecting the light was not the right shape, spoiling its diffraction-limited images. Fortunately, a refurbishment mission in 1993 allowed astronauts to install correcting optics, and subsequent Shuttle missions in 1997, 1999, 2002 and 2009 upgraded the instruments that analyse the light collected by the telescope, and replaced other failing parts. The final mission also installed hardware that will help in the ultimate de-orbit of HST when its mission ends. The idea of putting a telescope in space dates back to at least the 1920s, when rockets that might launch such an instrument were first being developed. However, the first concrete proposal that included a discussion of the science programme that might be possible with such a telescope was produced by astronomer Lyman Spitzer in 1946, which argued that such a facility could revolutionize our understanding of everything from planets to cosmology. Early experiments with rockets had rather limited success due to the difficulty in observing from such an unstable platform, but observations using telescopes attached to high-altitude balloons showed the potential for obtaining very sharp images over a wide range of wavelengths. Studying the collision of a comet with Jupiter. Soon after the optics had been repaired, Comet Shoemaker-Levy 9 collided with Jupiter, giving HST the opportunity to show that it could produce images of a quality that had previously only been possible with visiting space probes. Catching Stars Forming. 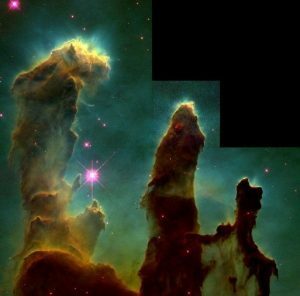 Perhaps the most iconic image obtained by HST is of the “Pillars of Creation,” which shows a star-forming region 7000 light years away, where light from recently-formed stars is eroding a gas cloud, allowing new stars to emerge. HST Deep Field Images. In a series of campaigns, HST has been pointed at seemingly empty sections of sky for weeks at a time, revealing the many faint galaxies in these regions. Many of these objects are very distant, so, due to the finite speed of light, seen as they were billions of years ago, allowing astronomers to determine how galaxies have evolved over the Universe’s lifetime. 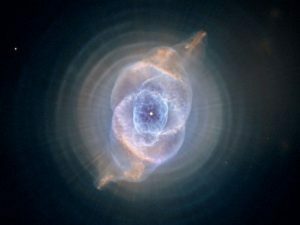 The Cat’s Eye Nebula, imaged with HST, is a planetary nebula, meaning that it is fairly normal star in the final phases of its life when it is shedding its outer layers. The concentric rings are where a series of spherical shells have been ejected, while the remaining structure seems to be a twisted jet. None of this intricate structure revealed by HST is well understood. [Credit: NASA, ESA, HEIC, and The Hubble Heritage Team (STScI/AURA)].